I just chose the narrator for the audiobook version of my book Chief Marketing Officers at Work. The audiobook will be published through Audible.com. I negotiated with my publisher for the full rights to the audiobook, so I get the full proceeds of each sale after Audible takes its cut, which equates to 40% of each sale. It would likely take 40-60 hours of my time. My time and attention is needed elsewhere, like marketing the book. I don’t know much about recording or narrating, so the quality probably wouldn’t be great. Instead, I went to ACX, which is the division of Amazon that handles the entire process of putting a book on Audible, including rights management, choosing a narrator, paying the narrator, and receiving payments for audiobook sales. I could find my own narrator and get the audio file and upload it, but I chose to use ACX for everything. I crafted a pitch for a narrator explaining a bit about my book and uploaded the first chapter so they could read it as their audition. I chose what rate I was willing to pay, measured per finished hour (PFH), and then waited to receive auditions. I received 30 auditions within two weeks. 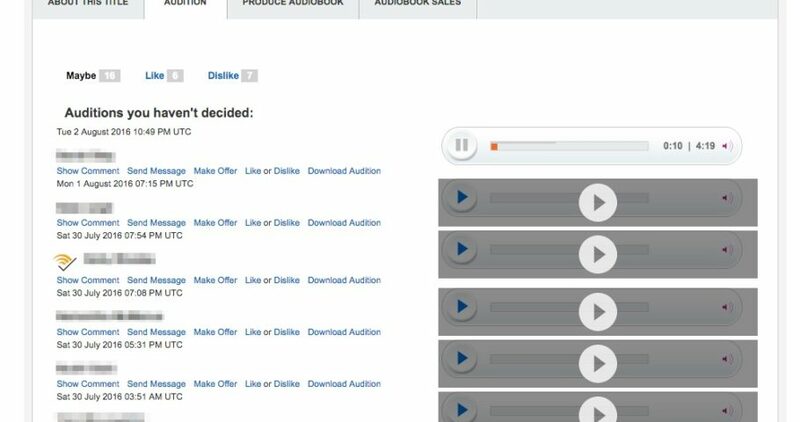 I then began the process of reviewing the auditions until I found the one I wanted, and then sent that narrator a specific offer, which he accepted (I ended up paying $150 per finished hour, with the total cost coming in at $2,419.35). Narrowing down the field of potential narrators was a bit like an eye exam, where I listened to the first audition and then the second and asked myself “Which of these is better?” If there was a clear difference I eliminated one and then tested the winner against the next one. As I went through each audition here are the things I noticed which resulted in me bumping certain auditions while keeping others for further consideration. Voice. Some sounded too young, some too old, some were too dramatic, some made pronunciation errors, some slurred their words while others enunciated too much, some sounded upbeat and others sounded like they were frowning or having a bad day, some were energetic and others lethargic. One person made awkward breathing noises that made me feel like I couldn’t breathe. In some cases I could tell within five seconds there was no way I was choosing a certain narrator. Technology. Some of the voices were fine, even great, but the technology they used put them at a disadvantage. Sometimes the reader sounded like he was in a bare metal room because there was so much echo. Some just didn’t sound as sharp, as though they were far from the mic, and in other cases certain sounds would pop too loudly and it was distracting. I felt bad for these folks, because my rejection had nothing to do with their talent, and everything to do with them not using the right equipment. But I don’t have time to tell 10 people they need to improve their technology and then wait for them re-audition, so they were eliminated. Speed. Several readers read too slowly. Interestingly, none read too fast. Maybe my opinion on this matter is the result of me always listening to audiobooks and podcasts at 2-3x speed. Content. I provided everyone with the first chapter of the book, which would take 20-25 minutes to read. I didn’t require them to read the entire sample, and I didn’t give any direction as to how much to include, so I received auditions of varying lengths. The longest was 33 minutes (I’m not sure exactly what went into that and didn’t listen to the whole recording to find out, but I can’t imagine it taking that long even if they read the entire sample) and one was less than a minute. Unfortunately for the 1-minute sample, she only recorded the bio before the interview (less than 5% of the sample, and I would have thought obviously not the meat of the sample), so I wasn’t able to listen to how she would have read the interview section, which was the most important part. It’s easy to eliminate someone based on a few seconds if the reader is really bad, but it’s hard to choose someone based on such a small sample even if she’s good, especially when she’s reading the brief intro content rather than the actual interview portion of the chapter. Do I really want to work with someone who isn’t sharp enough to get this? Timing. There is a flaw in the ACX system in that as near as I can tell, I couldn’t stop people from submitting auditions. After I had already narrowed the field down to the top five auditions I still received three more, but at that point I didn’t want to consider any more. I felt bad that people were still doing work to submit auditions, but I couldn’t see any way to prevent it. There were other narrators who were “eliminated” because they never auditioned. They sent me questions through the ACX system but due to other commitments and a full schedule I only had time to respond to a few of them and some of those who didn’t receive answers never submitted their auditions. Those who went ahead, despite not receiving answers to their questions, at least made it into the running. I did not reject anyone due to price or gender. The winner was actually the most expensive, and a female made it into my top three. There were five auditions that were very good, and I would have been happy to go with any one of them, but the one I chose did the best job of reading the interviews in a voice that made it sound like the real thing. If I had my way, the audiobook would contain the actual interviews I did with the CMOs that are featured in the book, but due to editing of the interviews there’s no way that would work. The winning narrator came close to making me feel as though I were there with Seth Farbman and the other CMOs, hearing their real responses. It felt natural, friendly, authentic. And by the way, listening to these auditions made one thing clear–I’m so glad I chose not to do it myself. These narrators, most of them anyway, know what they’re doing far better than you do when it comes to narrating a book, and they work hard for their money. I definitely made mistakes during this book-writing process. If I were doing it over again, the main thing I would change would be to provide a shorter reading sample. I gave everyone a full chapter because I had it handy and was too busy to think about doing anything else. That meant narrators could choose to read part of the beginning of the chapter, part of the end of the chapter, part in the middle, or the whole thing–I didn’t make it clear how much reading I wanted from them. It didn’t provide for a truly scientific sampling of the narrators. On the other hand, by unintentionally making it ambiguous I think it benefited me in at least one way in that I was quickly able to eliminate the one narrator who only read one minute of the chapter, and the “wrong part” as far as I was concerned. That said, I think I was hurt more than helped because as I learned after the fact, ACX asks you to submit an audition part no longer than five minutes, and simply throwing up a chapter and not giving any instructions along with it because it was most convenient to me makes me look less professional, and might turn off the most experienced and best narrators. Fixing this would have taken very little of my time, and my only excuses are ignorance, rushing, and a penchant for not reading directions. I also would have liked to have collaborated more with narrators, but I’m not sure where I would have found the time. It seemed to me to be a choice between spending time responding to questions and then waiting for answers, which might have delayed the project by 1-2 months, or simply listening to the 30 auditions I already had on hand and making a decision. I may have missed out on working with a great narrator as a result, but as it stands I found someone I was very happy with, at the right price, and it all worked out great in the end. I’m not a narrator so I’m not giving any advice of that sort. But I am an expert at being an ignorant, first-time author who is also running a business and is super busy and therefore is looking to take shortcuts wherever he can while still being conscious of the quality of the work he wants to get back. If that’s not the kind of author you ever want to work with then my recommendation would be to never submit an audition until you’ve first submitted a question and received an answer. If you do this, you’ll screen out authors like me. I’m not being sarcastic–I recognize the way I do things isn’t a match for everyone, and it’s better if we establish that early on and move along rather than wasting each others’ time. On the other hand, if your competitive advantage is that you can provide a high quality product with a quick turnaround, then people like me are willing to pay a premium for it, even if you’re relatively inexperienced. If you’re looking to earn that premium rate and win as much business as possible, my primary suggestion is to focus on what you can control. It doesn’t do any good to complain about authors like me. Many authors are first-time authors, have never run an audition for narrators, and are going to make mistakes. Many authors are working with publishers who introduce their own challenges into the process. I made mistakes, my publisher wasn’t perfect, and there are things I will do differently the next time around. But there is a line of 10,000 first-time authors right behind me, and if you’re complaining about them rather than compensating for them and their shortcomings you’re making yourself grumpy while doing nothing to win more business. Think of it as an opportunity rather than a challenge. Start a blog, podcast, or vlog about your life as a narrator and provide tips for first time authors. Maybe enough of them will find you and get educated and then hire you that you’ll never have to struggle to find clients again, and you’ll also never need to work with an uneducated author again. 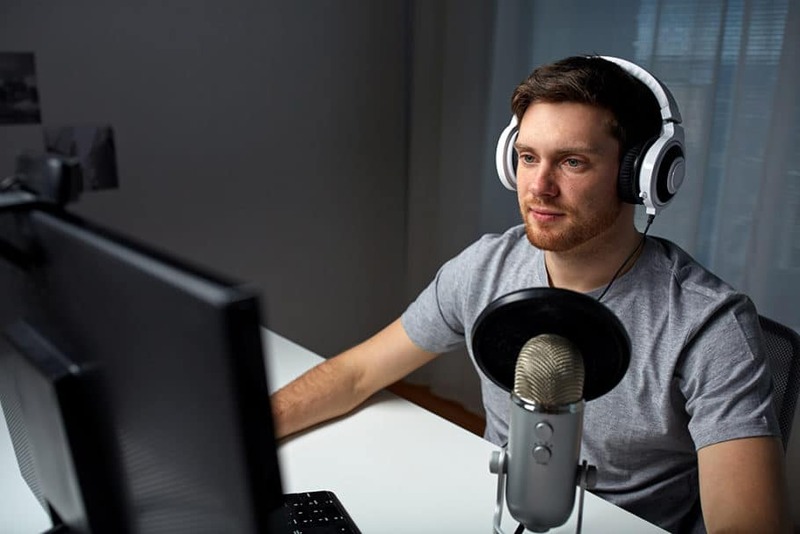 Are you an author who has recorded an audiobook? How did you choose your narrator? Are you an aspiring author with questions about the process of creating an audiobook? Please comment below.